As the United States celebrates the legacy of the March on Washington and Rev. Martin Luther King—the great prophet of peace and nonviolence—our presidential leadership is contemplating military action in Syria following the horrific events of recent days. The suffering from the deaths and displacement of thousands of Syrians cries out to the world for action. The use of chemical weapons, by whatever side in the conflict—a clear violation of international law after the United States and Europe perfected the use of chemical weapons nearly a century ago—clearly “ups the ante.” Chemical weapons no matter what the situation and not matter who used them represents, as John Kerry pointed out a “moral obscenity.” But how ought we to respond? For the United States and Great Britain, the response so far shows a lack of creative thinking. Both governments appear to be priming their publics for some sort of military action without any real legitimate intergovernmental mandate or clear plan for long term consequences in a similar way to Iraq. 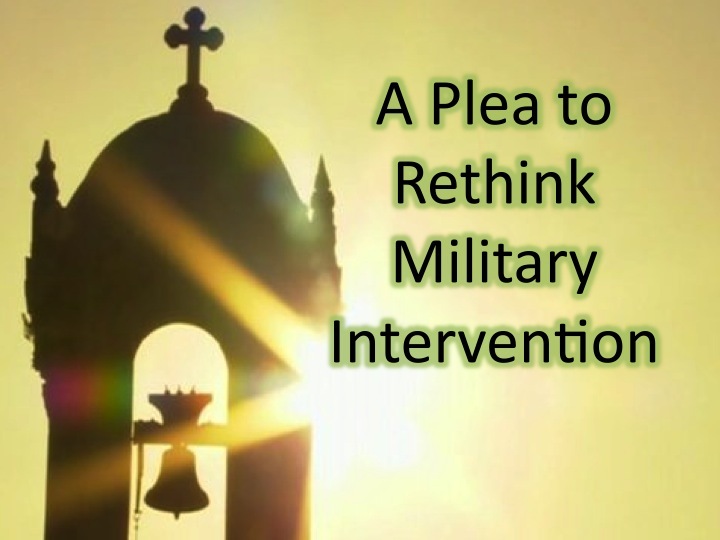 In the Catholic just war theory, legitimate authority plays a critical role. A war can have a just cause and be waged in a just way, but without a legitimate authority it remains unjust and immoral. For fifty years, Catholic social teaching has seen the UN as the legitimate authority to address international conflicts. This principle was affirmed by the Responsibility to Protect (R2P) framework that was adopted by the UN General Assembly and strongly endorsed by Pope Benedict on his visit to the UN. According to the R2P, if a national government is unable or unwilling to protect its citizens (as in the case of Syria) state sovereignty yields to legitimate international authority in the form of the United Nations or regional governmental bodies like the Arab League or African Union. It then becomes the responsibility of the broader community and not any one state of coalition of states to protect the people. Given its limited mandate and poor track record, I would point out that NATO is hardly a legitimate authority in this case. Right authority also lies at the core of the very idea of the United Nations and the very purpose of the UN Security Council. Again, the UN system needs serious reforms to strengthen its ability to reform or as Pope Benedict taught it needs to be given “real teeth.” Any intervention that circumvents this structure only serves to weaken the ability of the international community to respond to humanitarian issues. Intervention without the clear authority of an international institution fails both the moral and legal test. It is not the role of the US and UK to police the world. This is a shared responsibility of us all. Unfortunately, the ideologies of colonization and manifest destiny are not easy to break. Let me be clear, this is not a post in support of the Syrian regime or the rebels. Nor is it a post call for inaction. Not acting with military force does not mean taking no action at all. We must act. Yes, it’s complicated and difficult. Russia, Iran, Israel, Saudi Arabia (among others) all have invested interests. But shouldn’t this lead us to want to find an urgent solution without bombs? Let us reach out to the people of Syria to hear their perspectives. We must work with all parties involved to try to come to a creative diplomatic solution. We must examine our broader policies and the role played by our allies in the region in this conflict. It’s been done before and can be done again. As we contemplate how to best address the suffering of women, men and children, let us not forget to pray for peace and ask God to inspire us with the same gift of wisdom that led Dr. King to transform the world with nonviolent action. These are only some of my thoughts, we would love to hear other thoughtful and respectful reflections on how we might respond to this crisis. I specifically welcome those from Syria to share their experience. Kevin, thanks for your focus on the criterion of “legitimate authority,” which is so often overlooked in discussions of just war. As a follow up, what does it say about the legitimacy of authority of international or regional bodies like the UN if they fail to intervene in these kinds of humanitarian situations? I agree with you that the UN requires some reform and restructuring, but that would likely depend on the end of veto status for the five permanent nations. Which I don’t see happening any time soon. Thanks so much Steve for a great and important comment and question. Situations like Syria highlight for us how complicated and messy the international system is. As I mentioned above, the UN Security Council is far from perfect and that is due, in large measure to the unwillingness of the US, UK, Russia and other permanent members from allowing other kids to play on the playground. Of the G8 nations, the US, in particular, is notorious for not working within the international legal framework that has developed as not wanting to work within the system and not following the rules that it sets for other nations (we still have yet to get rid of our stockpiles of chemical weapons and our human rights and war ethics record is quite dirty). We have a lot of wood in our own eyes that need to be pulled out. Anyway, few quick points. 1.Again, the UN is not perfect but it is much more of a legitimate authority than the US and UK working alone and the UN has a good track record for other conflicts where successful peacekeeping operations have saved many and where it plays a key role in leading refugee and humanitarian efforts. 2. The UN is not the only legitimate actor here. The R2P framework and the Catholic social tradition also speaks of regional intergovernmental bodies. It’s time that the Arab League also takes some leadership here. In-fact, the Arab league has great promise to find some peace in this regional conflict. It will take time and effort, but we should realize that it’s not all about us. We need a political humility.